Please activate the Tree-Views for each explorer list view in Q-Dir, it doesn't matter whether is it Windows 10 / 8.1 Server 2016/2012 or other Win OS! 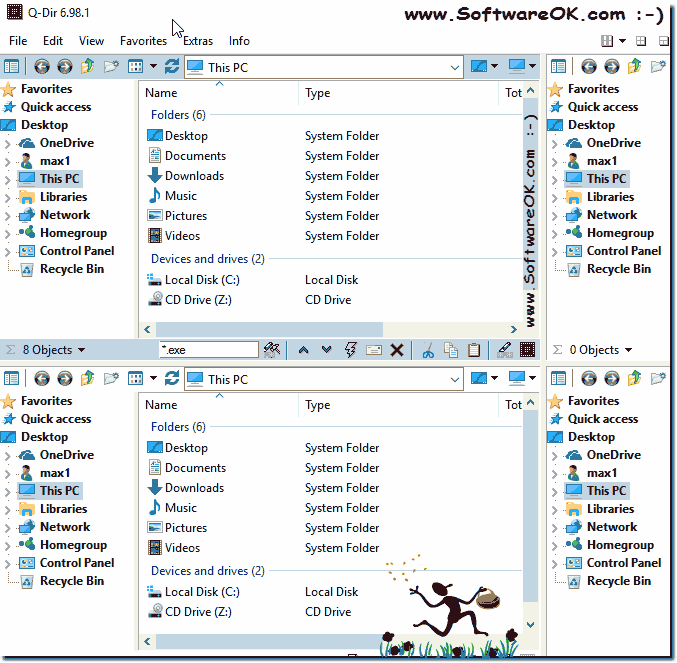 Since the release of Windows 7, users can use folders as well as libraries to help them find files and folders no matter where they are. This will also be displayed in the Q-Dir directory tree. The library is a virtual directory of files and links that are collected in one place. Files are grouped by type without having to move the file itself. All data entering the library undergoes indexing, which, depending on the file type, contributes to the contextual search, which also benefits the alternative file manager Q-Dir. See also: ► Disable the Windows Explorer file grouping in Q-Dir! Activate and deactivate as required in the individual Explorer windows! See also: ► Tabs are not always displayed in the Explorer view? (Image-3) separate tree view for each explorer list view? Tip: You can make additional helpful settings via the Extra directory structure menu. The e.g. In Windows 10 Explorer are not so possible! Of course you can also configure many parameters for directories and their contents in Windows 10 like in any other Windows system. However, the folder settings in Windows 10 have a slightly more advanced view compared to other similar operating systems. And you can access the configuration in several ways. (Image-4) Settings for tree view for all explorer views! By optimizing or customizing the folder view in the Q-Dir Explorer, you can organize your workspace comfortably. And with the sorting option for a particular column, finding content on a particular basis is easy. And adjust how the folders are displayed to you, as well as the function white of the directory structure! See also: ► How can I edit / copy very long directory names with the Vista address bar? Q-DIR - FAQ-32: Can i have a separate tree view for each explorer list view? There are different ways to see folder size, file size and eg the file extension in the individual File Explorer layers Content / Solution / Tips: 1. I'm now using Q-Dir v 6.82 and have a question: I click on the "Each has one" menu item and the "Folder Pane" that was on the left disappears - I do not get a folder pane in any of the other windows. I can bring it back by clicking on "One 4 all", but it goes again if I click on "Each has one". I thought I did have a "Folder Pane" in each of the other windows when I was using v5.74, but maybe I am mis-remembering. Am I doing something wrong? I was looking for the "Tree" icon in each window while the "One 4 All" tree was being displayed on the left. But that icon appears only after the "One 4 All" tree is turned off by clicking on the "Each has one" menu item. I really like the ability to toggle between "One 4 All", "Each has one" and "None has one" - that is so useful!